A technician's hand filling wells with a liquid for a research test. 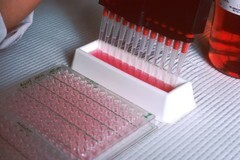 This test involves preparation of cultures in which hybrids are grown in large quantities to produce desired antibody. This is effected by fusing myeloma cell and mouse lymphocyte to form hybrid cell (hybridoma).